Granulocytes belong to the myeloid cell family and represent the most abundant cell type in peripheral blood. They are characterized by the presence of cytoplasmic granules and a poly-lobed nucleus, which gives them the name polymorphonuclear leukocytes (PMN, PML, or PMNL). Special staining techniques developed by Paul Ehrlich in the late 1800s allowed the identification of granulocytes in blood and opened the possibility to study these cells in different pathological conditions. Granulocytes are derived from stem cells in bone marrow. They have a short life span in the periphery, which can be prolonged at sites of infection. Located at strategic points in the body with preformed cytoplasmic granules filled with various effector molecules, they are among the first responders at the onset of innate immune responses. Granulocytes play a well-known role in inflammation and allergy, but are also capable of antigen presentation and immune response modulation (PMID: 23007469). The toxic mediators produced by these cells have been undeniably linked to various pathologies, and therapeutic approaches targeting granulocytes are currently under development to treat allergic diseases and asthma (PMID: 28784414 28283697, 26819959, 23485549, 28099862, 27558343). Granulocytes circulate through the body via peripheral blood and account for approximately 25–75% of CD45+ leukocytes. They can be divided into three subtypes – neutrophils, eosinophils and basophils – named according to their characteristic staining with hematoxylin and eosin. Basophils stain dark blue, eosinophils red, and neutrophils stain pink. Neutrophils represent the most abundant type of granulocytes, accounting for 25–75% of all circulating human white blood cells (PMID: 23435331, 22491176). Their mechanisms of action encompass degranulation of antimicrobial proteins, release of chemotactic factors (PMID: 22392929, 20140197, 25512469, 21555529), and formation of neutrophil extracellular traps or NETs (PMID: 23435331, 22491176, 15001782) in response to pathogens. Typical markers are CD15, CD66b, CD16, and the absence of CD49d. Representing 1–10% of peripheral leukocytes, eosinophils in resting state reside mainly in the periphery, especially in lamina propria (PMID: 11877470, 25049430). They readily release their granule content including eosinophil cationic protein (ECP), eosinophil peroxidase (EPX), and major basic protein (MBP) as well as chemokines, and cytokines in response to pathogens (PMID: 25003763). They play a role in antigen presentation and T cell polarization (PMID: 25003763, 8450230, 20065995, 16551246). A specific marker of eosinophils in human blood is Siglec-8. Other commonly used markers are CD15, CD193, and the absence of CD16. Basophils are a small population, accounting for only 0.2–1% of white blood cells (PMID: 28506528). They are rich in pre-formed granules containing histamine, leukotrienes (LTs), and platelet-activating factor (PAF). Under specific conditions, they play non-redundant roles as effector cells and promote TH2 differentiation. They can release large amounts of IL-4 and may take part in dendritic cell modulation. A specific marker for blood basophils is CD203c. Other typical markers are FcεRIα, CD123, and the absence of CD117 (PMID: 27135604, 23558889). Eosinophils and neutrophils can be isolated directly from whole blood, without prior sample preparation. For some applications and for the isolation of basophils, blood, buffy coat, or buffy cone are first processed to generate PBMCs. For additional information about human peripheral blood, see the MACS Handbook chapter Human cell sources – Blood (human). Miltenyi Biotec has developed a special protocol to generate PBMCs from whole blood for subsequent isolation of granulocytes. This protocol provides step-by-step instructions for performing a density gradient using freshly drawn human blood treated with an anticoagulant (preferably EDTA or citrate, ACD-A, CPD) or fresh defibrinated blood or buffy coat (not older than 8 hours) treated with an anticoagulant. The resulting white blood cell layer directly above the red blood cells is collected and diluted with buffer to wash the cells. Any remaining red blood cells are then lysed and the white blood cells are washed twice. Finally, the cell pellet is resuspended in an appropriate buffer, and cells are counted before proceeding with magnetic cell separation. This protocol can be found as an appendix in the data sheet of the CD16 MicroBeads, human, which you can download from the related resources panel to the right. Miltenyi Biotec has developed numerous products for the straightforward magnetic separation of granulocyte subsets. Both positive selection and depletion strategies can be pursued for cell isolation directly from blood. Several positive selection strategies are possible to isolate granulocytes from PBMCs. StraightFrom® MicroBeads can be used to isolate granulocytes directly from whole blood. Pre-enrichment of white blood cells by density gradient centrifugation is not required. The purified cells are well-suited for further flow cytometry analysis, molecular biology studies, and functional studies. MACSxpress® Technology is a cell separation platform especially designed for processing large volumes of anticoagulated whole blood. Untouched human leukocytes can be isolated rapidly from up to 30 mL of anticoagulated whole blood by removing immunomagnetically labeled non-target cells. The MACSxpress Eosinophil Isolation Kit, human and MACSxpress Neutrophil Isolation Kit, human have been tested by independent labs and found to be the optimal solutions compared to density gradient and products from other manufacturers (PMID: 28647456, 27567327). Efficient enrichment of neutrophils from whole blood. Untouched neutrophils were isolated from 8 mL of human EDTA-anticoagulated whole blood using the MACSxpress® Neutrophil Isolation Kit, human, a MACSmix™ Tube Rotator, and a MACSxpress Separator. The isolated cells were fluorescently stained with CD14-PerCP, CD15-PE, CD16-APC, CD45-VioBlue, and CD193-FITC and analyzed by flow cytometry using the MACSQuant® Analyzer. Cell debris, non-leukocytes, and dead cells were excluded from the analysis based on CD45 expression, scatter signals, and propidium iodide fluorescence. It should be noted that neutrophils are extremely susceptible to non-specific activation. However, isolation of neutrophils with the MACSxpress Neutrophil Isolation Kit, human does not activate the cells, as shown by analysis of surface expression markers, adhesion, migration, phagocytic capacities, and production of reactive oxygen species (ROS). A scientific poster describing results from this analysis can be downloaded from the related resources panel to the right. Both positive selection and depletion strategies are possible with different Miltenyi Biotec products. The Basophil Isolation Kit II, human and Eosinophil Isolation Kit, human use a cocktail of biotin-conjugated antibodies to indirectly label non-target cells. The highly pure eosinophils or basophils that result from the depletion of the magnetically labeled cells are suitable for functional studies on signal transduction, activation mechanisms, or cytokine production. Working scheme for the isolation of untouched eosinophils using the Eosinophil Isolation Kit, human. High purity of isolated eosinophil population. 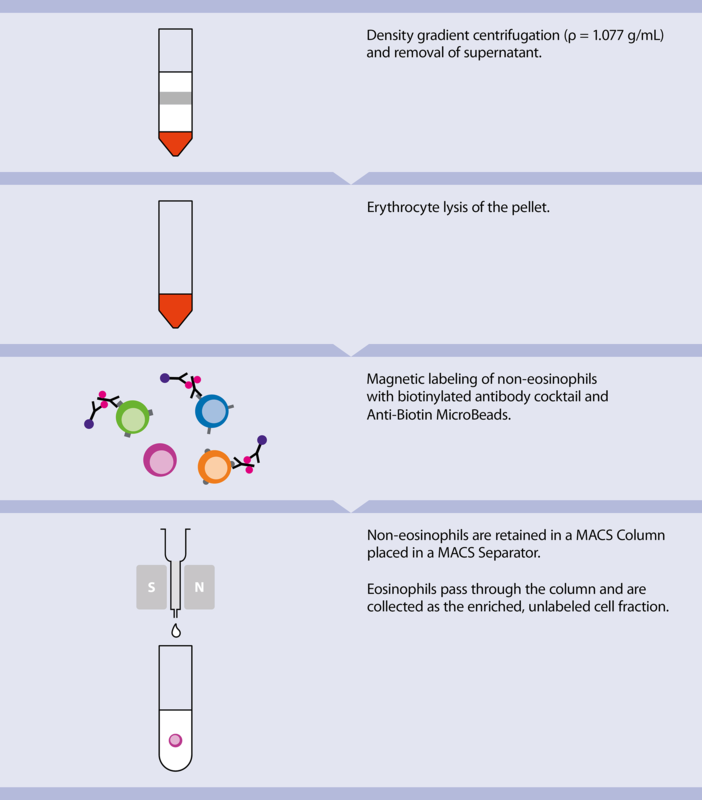 PBMCs generated from human peripheral blood served as starting material to isolate untouched eosinophils using the Eosinophil Isolation Kit, human, an LS Column, and a MidiMACS™ Separator. Cells were fluorescently stained with CD16-FITC. Eosinophils do not express CD16. Flow cytometry analysis of whole blood after erythrocyte lysis. (A) Scatter profile of all white blood cells after exclusion of dead cells and debris. Neutrophils can be identified based on high granularity (side scatter) and CD16 expression, whereas eosinophils lack CD16. (B) Scatter profile of back-gated neutrophils and eosinophils. (C) Basophil gating after exclusion of dead cells and debris. Basophils are defined as CD203c+CD123+ cells.